PULLMAN, Wash. – The impact of the Depression-era Works Progress Administration often is measured by the millions of jobs it created, the billions of dollars spent on national public works projects and even a song about the Grand Coulee Dam by folksinger Woody Guthrie. In the Pacific Northwest, one WPA project had a different benchmark: the column inch. “Clipped History: The WPA and the Stories Behind the Pacific Northwest Newspaper Collection,” will be on exhibit March 27-July 18 at Washington State University’s Manuscripts, Archives and Special Collections in Terrell Library. An opening reception will be 3 p.m. Thursday, March 27, in the MASC main lobby. The exhibit details how local WPA workers in the 1930s clipped more than 400,000 articles from Pacific Northwest newspapers dating back to 1890. Today, the clippings are being digitized as part of MASC’s Kimble Northwest History Database (http://content.libraries.wsu. Just as important historically are the unpublished stories of the more than 80 men and women who made up the Index and Clipping Bureau in Spokane, Wash., sponsored by then-Washington State College. President Ernest O. Holland and Professor Herman J. Deutsch oversaw the bureau’s hiring and operations at a time when casualties of the Great Depression were scrambling for any job they could find. WSC graduates – unemployable even with a college degree – women, African Americans and immigrants pored over tons of newspapers searching for items of historical interest. They made history themselves by mirroring the expanding opportunities and growing hopes playing out nationally during the WPA’s eight-year tenure. The WPA funded a variety of employment opportunities, most notably for highway, road and street projects as well as public buildings. But it also funded library service training and jobs pertaining to the arts, said Greg Matthews, WSU Libraries metadata librarian and photographs curator. “So artists, writers, musicians and actors also benefited from assistance,” he said. “Some of the notable cultural figures who worked for the WPA include visual artists Jackson Pollock and Ben Shahn as well as writers Eudora Welty (as a photographer), Zora Neale Hurston, Studs Terkel and John Cheever. “Works produced by these and other WPA-related artists included everything from posters, technical manuals and public health documents to pieces devoted to telling stories relevant to personal and regional interests,” he said. That’s why the Index and Clipping Bureau started. 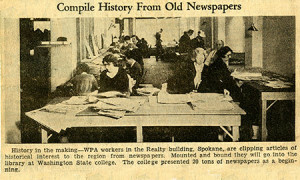 Attached to the WSC Library, the Spokane-area WPA project chronicled the newspaper history of the Inland Empire – and offered a lifeline to the region’s unemployed and marginalized. WSC alum H. Arthur Pommer, one of the bureau’s employees, personally wrote a letter to President Holland after he was unable to find even unskilled work after graduation. Librarian Elizabeth Tommas and bureau supervisor Lillian Mitchell represented a departure from the typical jobs women workers in the WPA held, such as sewing and teaching. And Willabel Thomas was one of five African Americans to work at the bureau – an almost inconceivable feat given the discrimination African Americans faced during that time. Making do during the Depression became second nature to many as money and resources nationwide dried up. Workers at the Index and Clipping Bureau took the same tack by storing newspaper articles in more than 400 boxes they carefully made from repurposed materials. Salvaged cardboard, fireworks boxes, shoeboxes and old menus were recycled to live a new life as archival boxes, spacers and dividers. “This ‘make-do’ storage system kept the clipping collection safe for nearly 75 years until 2013, when it was replaced with archival storage boxes purchased with a donation from the Kimble family,” said Doug Lambeth, WSU Libraries digital projects production coordinator. Wallis and Marilyn Kimble, both WSU alums, also donated funds in 2001 to digitize the Pacific Northwest Newspaper Collection. Since then, WSU students have scanned 100,000 of the original 400,000 clippings for the Kimble database – essentially performing the same work as the WPA bureau workers did in the mid-1930s. Lexi McGinnis, a WSU sophomore majoring in strategic communications, is one of the students working on the digitization project. She focuses on articles from the University of Idaho and WSC in the early 1900s.